First time in Turkey - Cable Car was built for the purpose of Public Transportation. 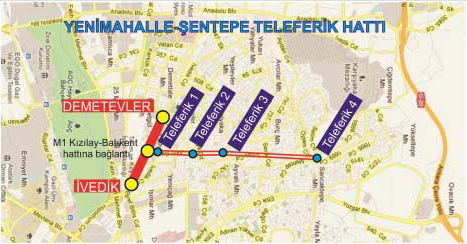 Cable car system that was constructed between Yenimahalle and Şentepe, first began with the Ankara Metropolitan Municipality Assembly's decision numbered : 172, dated 02.13.2012, then tendered for technical research and discussions on 08.15.2012, as a result the route and the system was identified. Afterwards the work was tendered on 03.26.2013 and then a contract was signed with the contractor on 05.14.2013, wherein the construction work started. Then with the opening the cable car started carrying passengers on 06.17.2014.